giving guests a peaceful, scenic view. The Greystone Lodge on the River has just undergone a complete renovation now offering King and Queen Executive and Executive Deluxe rooms and Suites with whirlpool tubs, fireplaces, bunk beds for the kids. 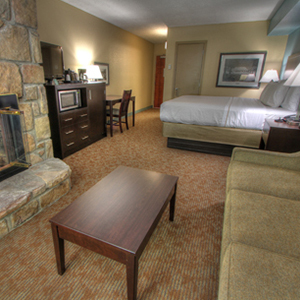 Rooms have flat panel TV's, mini-fridges and most rooms have in-room Wi-Fi. There are also several cottages on the adjoining mountainside that are perfect for families or group gatherings. Every day is a free hot breakfast and during the summer guest enjoy the outdoor pool with waterslide and toddler splash pool. Many of Gatlinburg's favorite restaurants and attractions are just out the door of the Greystone Lodge on the River. A short walk takes you to the Parkway and No Way Jose's Mexican Restaurant, the Mountain Mall, Doc Colliers Moonshine Distillery and dozens of other restaurants, shops and attractions. And the biggest attraction of all, the Great Smoky Mountains National Park, is less than a mile from the Greystone. Hop in your car, take a right on the Parkway, and you will be driving into the majestic beauty of one of America's finest National Parks in no time. 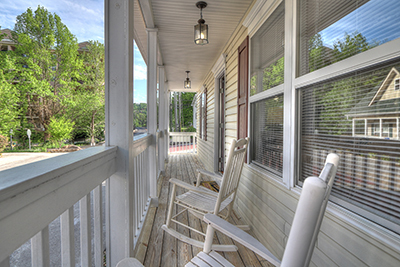 The Greystone Lodge on the River offers Southern Hospitality in an elegant, yet comfortable setting that is convenient to all of the fun and excitement that Gatlinburg and the Smokies have to offer. For more information Smoky Mountain information go to http://bestreadguidesmokymountains.com/ or download the BRG App for deals, maps, Points of Interest and Visitor Information.